The title alone shows how badly they were misled by the authors: there is NO evidence that changes in bacteria caused anything here. Thanks “researchers” for misleading everyone about your study. I can’t even go on. The issue is simple. The researchers did not show that the bacteria caused ANYTHING. They just showed that the bacteria found in people after quitting smoking were different than before quitting. And they also showed that these people had some other changes in their systems after quitting – like weight gain. Does this mean the bacteria caused anything. NOOOOOO. 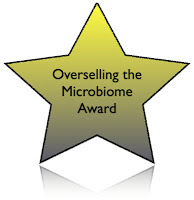 I am just going to give the Swiss National Science Foundation my coveted “Overselling the microbiome award” for a misleading and inaccurate and potentially dangerous press release. I kind of feel badly I even mentioned it. I don't want to be the Bearer of Dumb Press Releases. But thank you for fisking this. Hello, I couldn't find an email address so I have posted this here – sorry. I am the webmaster of http://www.TreeofLife.net.au , a website aiming to be a definitive source of broad based information about the Tree of Life, bringing together much of the 'splintered' information on the internet into one catalogue – this will soon be supported by a blog to allow for public comment and contributions from individuals to expand the information source. The site is not designed to be technical but more generally informational and as you will see is still in the early development stage. I would like to add some references to your blog on my site and hope that you are OK with this. I would also like to request that you link from from your blog to my site, which I will reciprocate, such that we have reciprocal linking to each others mutual benefit. I look forward to your positive reply.